By now most residents of the Dallas / Fort Worth area are aware of the giant, 35,000 lbs steel robot that towers over DART’s Deep Ellum rail station. Robot builders may also be aware of the robot from coverage in Robot Magazine. 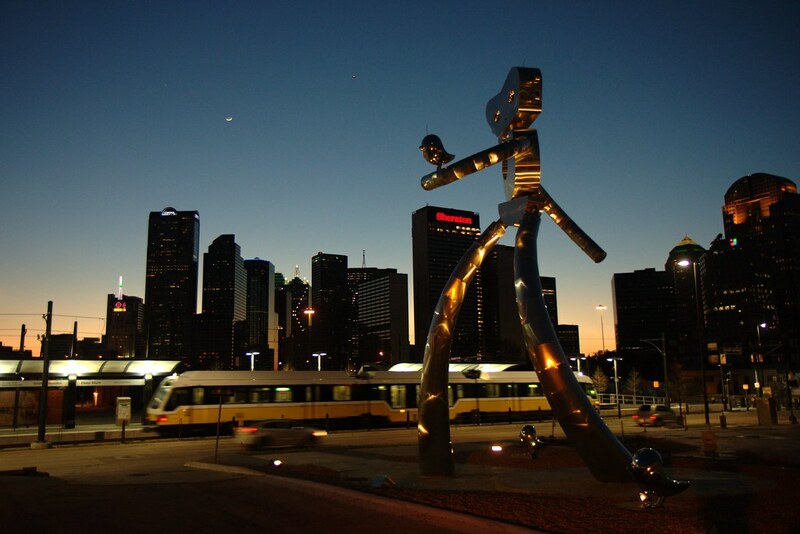 Now, the rest of the world is taking notice because the prominent art organization, Americans for the Arts, has included the Dallas Robot, known officially as Traveling Man, on its list of the 40 Best Public Art Works in the US and Canada. 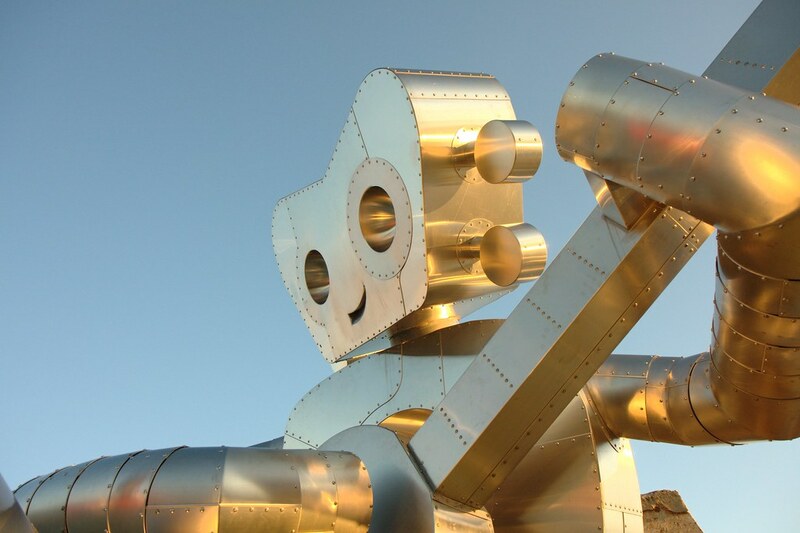 Read on to learn more about Traveling Man and see more photos of the big robot and little chrome friends. So what’s the story behind this giant robot? A combination of opportunities and influences led to its creation. Dallas Area Rapid Transit or DART as it’s known locally, was expanding into the Deep Ellum area with a new rail line and a Deep Ellum rail station. 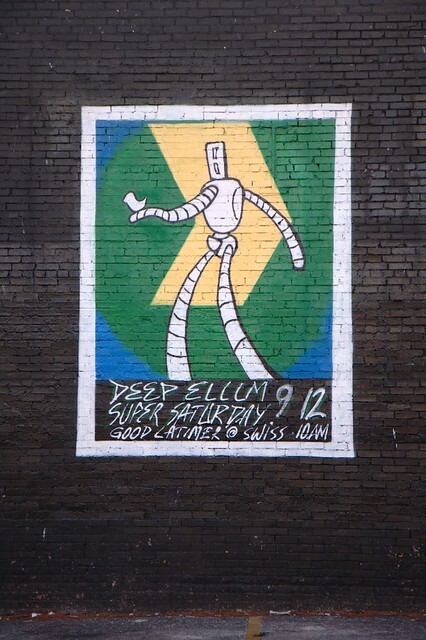 Deep Ellum is the historic Dallas arts district from which have come a long list of musical and visual artists. The area is also well known for its many public art pieces, many improvised in local do-it-yourself fashion. Painters and sculpters often create art on the exterior of their own or other buildings in the area. 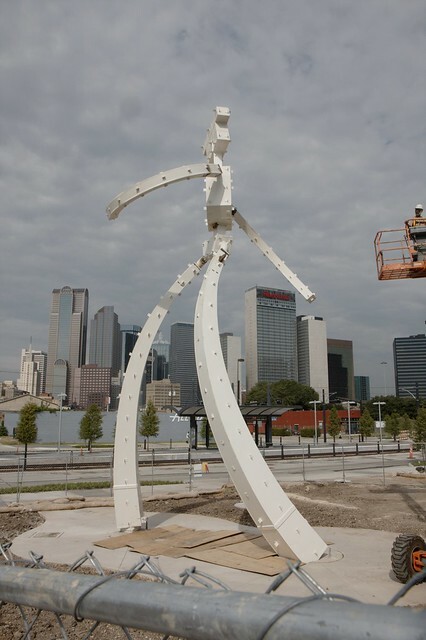 Traveling Man Walking Tall sculpture seen (from left to right) as represented in paint on the Deep Ellum news wall, as a steel superstructure during construction, and in its finished form. The DART rail plans called for destruction of a favorite landmark, the Deep Ellum tunnel, whose sides were covered with art murals. Since DART has a small budget for public art for each of the station, it was decided that DART would commission local Deep Ellum artists to create a public art piece around the new station. 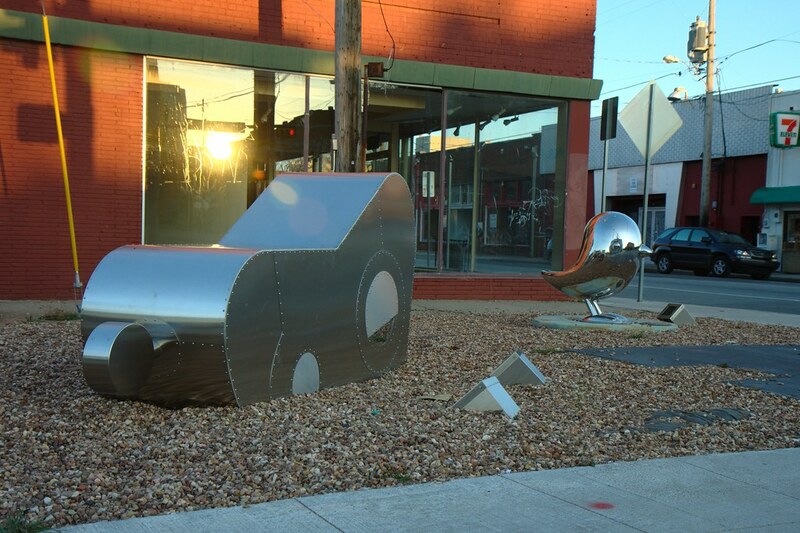 The main pieces were to be giant sculptures designed by local artists Brad Oldham and Brandon Oldenburg. 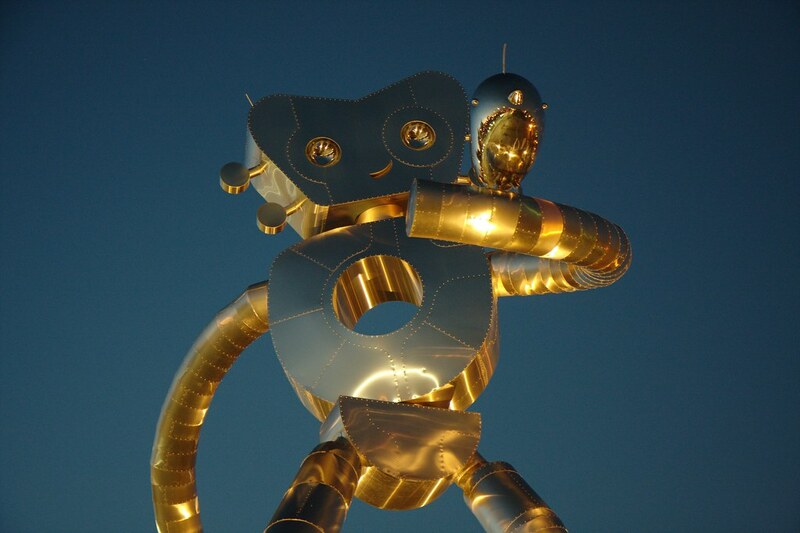 They created a set of three large metal works, known collectively as Traveling Man. The first sculpture, titled Awakening, shows the robot’s head emerging from the ground. The backstory, imagined by the artists, explains that song birds inhabited an elm tree that grew above a buried steam locomotive. When a Deep Ellum musician spilled his gin on the spot, the Traveling Man formed underground as a result. The robot awakened and emerged along with his songbirds. In the second sculpture, Waiting on a Train, our giant robot has walked a block down the street and is now seated on a large concrete slab salvaged from the historic Deep Ellum tunnel. The robot is playing a guitar as the cars and trains pass by. In the words of Brad Oldham, “he reminds us that life can slow down a bit to hear the music”. The third and largest sculpture, Walking Tall, depicts the Traveling Man strolling past the new DART station with a smile on his face and one of the song birds perched on his arm. This sculpture links the surrounding neighborhood with the station, welcoming visitors and residents. Walking Tall stands nearly 40 feet tall, weighs 35,000 lbs, and is supported by concrete piers sunk 32 feet into the ground. Each sculpture is composed of a steel skeleton covered with a stainless steel skin attached by monobolt rivets. Aside from a few cranks, who were outraged that city funds were spent to beautify the city, there has been nearly unanimous support for DART’s Deep Ellum art project. It has been pointed out that the cost the installation is roughly equivalent to about 57 feet of DART rail. And the success of the installation has pretty much silenced the critics. Almost as soon as they were completed, the sculptures began attracting lots of visitors and photographers. At almost any time of day or night, you can spot people gawking at Traveling Man or photographing their friends sitting on the surrounding chrome birds, which double as chairs. 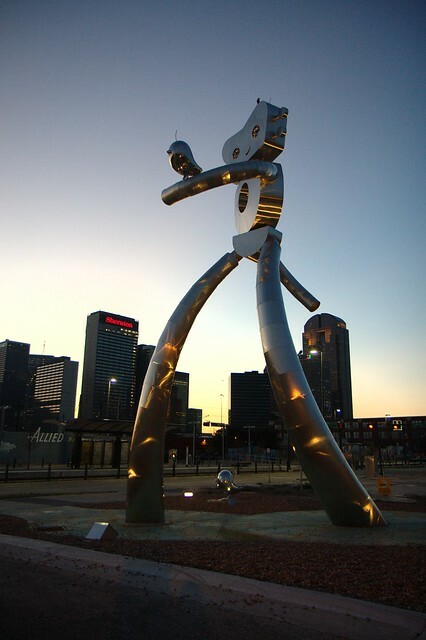 So for Dallas residents, the recognition of Traveling Man by Americans for the Arts just confirms what they already knew; everybody loves Giant Robots! You can see more photos of the Traveling Man sculptures in my gallery on Flickr.